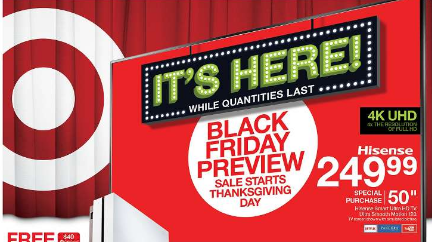 Earlier today Target dropped its Black Friday ad and the offers are very similar to those offered by Sam’s Club: same popular brands and competitive prices. When it comes to TVs the deals tend to differ as far as sizes offered at a major discount. There’s plenty of Samsung 4K UHD TVs in the 50, 55, and 60-inch range as well as a Hisense 50-inch 4K set with a steep price drop of $250 to $249.99. The Samsung 4K sets all have steep price drops as well. Target also has a large selection of tablets and smartphones available in addition to a VR headset. 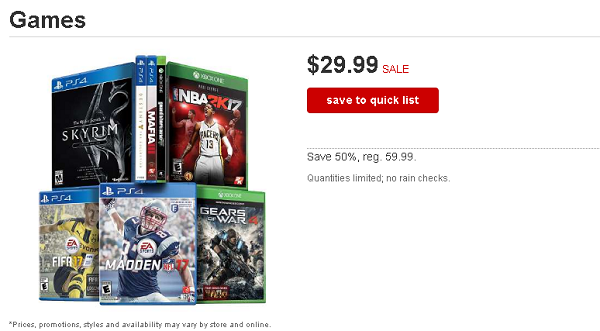 If you’re interested in gaming consoles there are some very similar deals to Sam’s Club. Both are offering Xbox One S 500GB and PlayStation 4 500GB bundles at $249.99—a drop from $299.99—but the retailer is offering a $40 gift card. They’re offering a lot of games at a discount and Nintendo’s 3DS Super Mario Edition for $99.99. If you can’t wait until November 24th, you can try the early access line-up which kicked off today, but the major deals kick off Thanksgiving at 6PM.